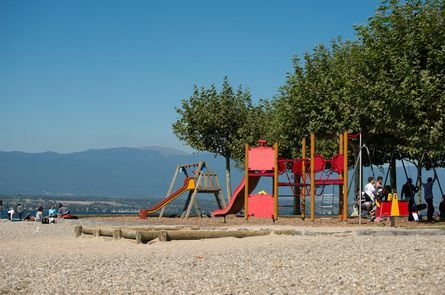 Now that summer is finally here, what better way to enjoy the sunshine than let your little ones splash around in one of Geneva’s paddling pools, lake beaches or great lidos ? 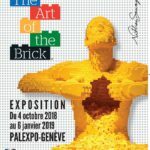 Although we often say that life in Geneva is very expensive, did you know just how many free pataugeoires there are in the city? 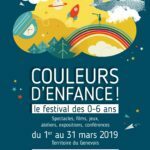 If you’d like to find out, the official Ville de Genève website has published a very useful map of all the free wading-pools for children that can be found in town. Click here to view the map: you will see that there are eleven in total, located in some of Geneva’s best parks. These paddling pools are for children under the age of 7 and remain open from May till September. 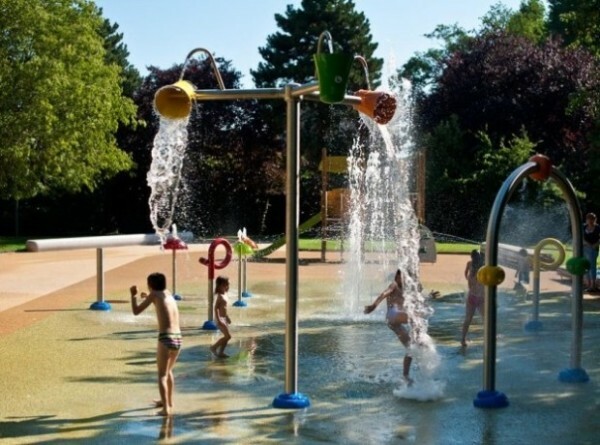 A great playground equipped with fab water features is also the Parc de l’Auberge in Meyrin. It is free of charge and features great water jets, tipping buckets as well as the other playground classics like climbing frames, slides & swings. You can read more about it in our previous post. The only free public beach in Geneva is Baby-Plage on Quai Gustave Ador, open all year round but especially busy in the summer. It’s a lovely sand beach with climbing ropes and tyres hanging from the nearby trees, which create an excellent play-area for the children. Swans like to get quite close too! There are many other great beaches along Lake Léman that you can find listed on the excellent “Guide des plages du lac Léman” by Thomas Uriot (published by T.A.W.U. & Co., 2010). This book is a complete guide to the 140 beaches around Lake Léman on both its Swiss and French side. Yes, it is all in French, but the great thing about it is that each “plage” comes with a brief description, which tells you if it is a pebble, sand or grass beach (or simply a platform or diving board), and a photo. 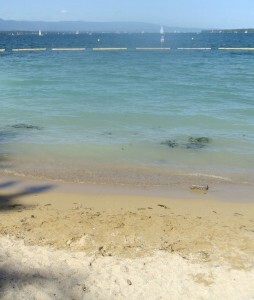 Alternatively, you can find a list of all beaches on the Léman Plages website (in French). A golden oldie on the Rive Gauche is definitely the Plage d’Hermance, in the beautiful medieval village of Hermance (Quai d’Hermance – with public transport Bus E, stop Hermance). You will find a good playground, showers, toilets, a floating board for diving and a buvette. Hermance Beach is located next to the campsite in Hermance, entry is 4CHF. 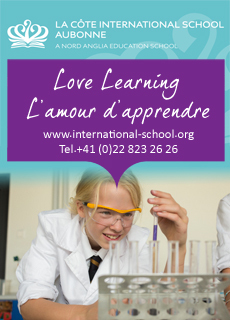 Opening times are 9am to 7pm from the 15th of May to the 15th of September. 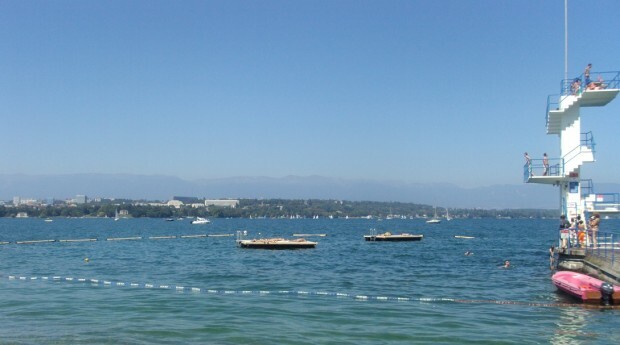 Our family favourites are: la plage de Port-Choiseul in Versoix, the Bains des Pâquis in Geneva, Genève-Plage (see below) and a bit further away the Plage des Trois Jetées in Nyon and Divonne Plage in nearby France. 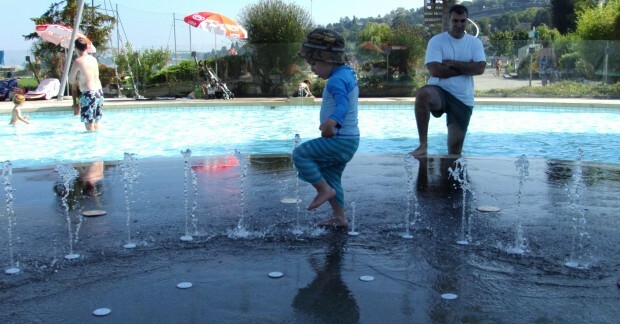 Most of the communes in and around Geneva have an outdoor public pool or lido, great for kids and over-heated parents. 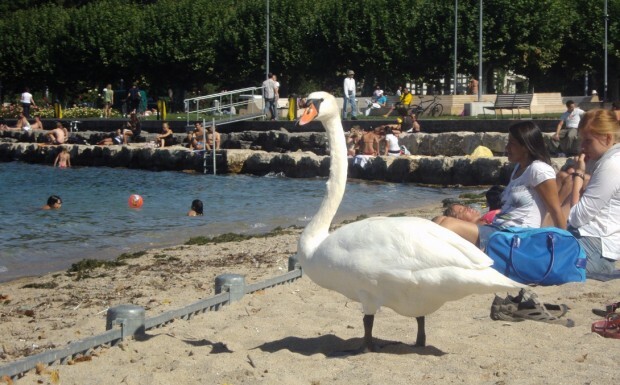 To me, however, Genève-Plage is the bee’s knees. For a small entrance fee, not only do you get adult and kids’ pools, water slides, a sand play-area, sun-loungers and a 10mt diving-platform on the lake, but a taste of authentic city history as well. You can find outdoor swimming pools in Cointrin, Lancy, Meyrin, Thônex and Carouge. 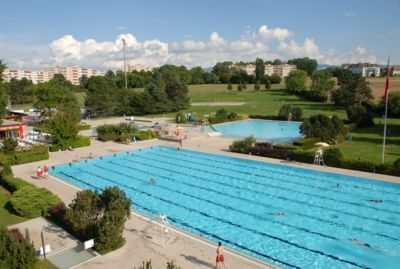 The Piscine des Vergers in Meyrin (Avenue Louis-Rendu) has an outdoor olympic size pool, a paddling pool, water slide and a bassin “non-nageur” for beginners. 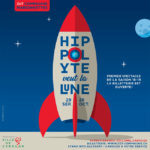 The piscine is open from May to September: 10am to 8pm everyday. 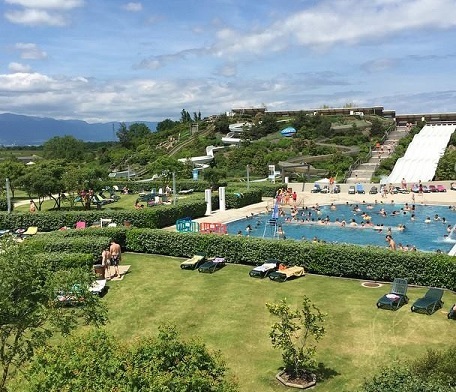 In Nyon you’ll find the excellent Colovray swimming pool, with kids pool, play-area and access to the lake. A personal favourite of mine is the swimming pool in Versoix. 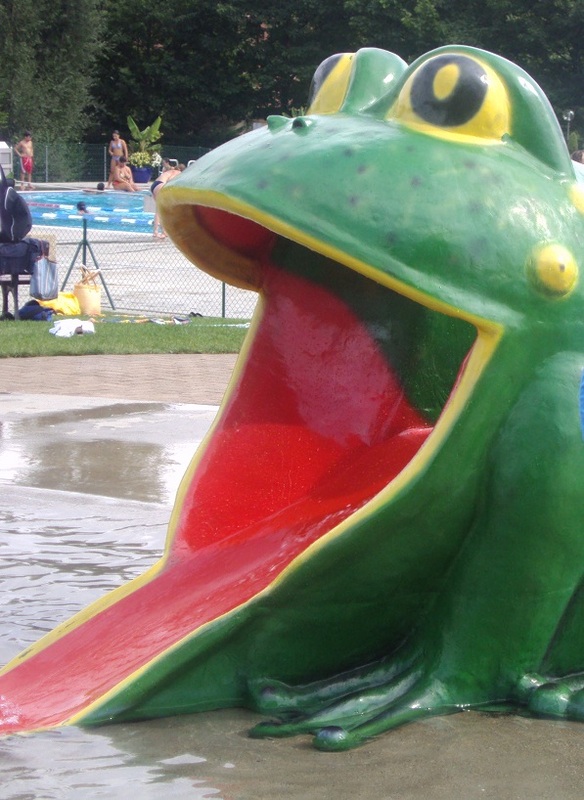 It has an excellent baby pool with frog slide (photo below!) and, since it’s smaller than Genève-Plage , it’s much easier for me to keep an eye on all three water-babies if I am alone. 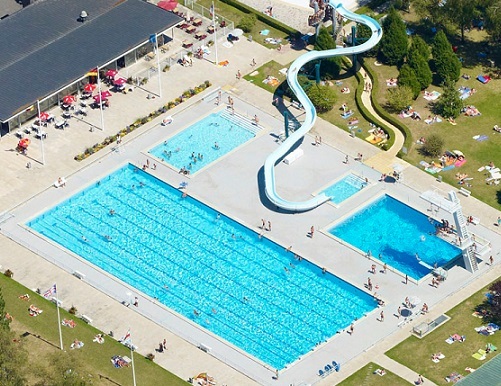 And, of course, don’t forget about the spectacular outdoor pools and waterslides at Vitam’ in Neydens (France). Their outdoor aqua park is open every weekend in May and June and every day from the 4th of July until the 30th of August from 10am until 8pm. On the 29th and 30th of June, as well as the 2nd, 3rd of July and 10th of September they are open from midday until 7pm. Click here for full details about entry tickets. 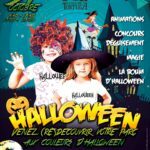 There are other great outdoor pools in nearby France, including the piscine de Divonne and the Centre aquatique Château Bleu in Annemasse. 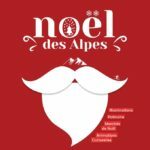 Last but not least, you can find a complete list of swimming pools in France on this great website. We hope you’ll find this post useful, please let us know which ones are your favourite summer spots! Thanks for this posting. Last year we didn’t explore the water this much, but with 2 little water babies, we’re hoping to visit lots of water parks this summer so I’m sure I’ll be back again and again to look for ideas. Keep up the good work!